During the Victorian period blended whisky became very popular, overtaking the traditional malt. Blended whisky was made from malt and grain, producing a drink that was lighter and more suitable for social occasions and drinking with mixers. 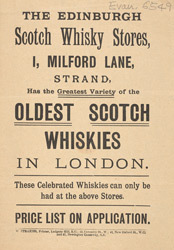 The popularity of blended whisky in Britian spread across the empire, and whisky became one of the world’s favourite drinks.